When customer service is at the heart of its brilliant offering of prized TVs, cinematic goods and more, you know that Richer Sounds is a retailer you can trust. Owned by the founder and managing director, Julian Richer, Richer Sounds has been going since 1978 when the first shop was set up in London. 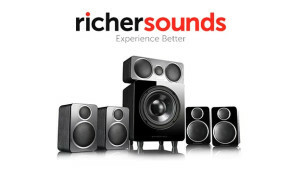 Now boasting 53 stores nationwide as well as a fruitful online catalogue, Richer Sounds has built a solid reputation as that reliable supplier of premium audio, TV and home cinema products. With Richer Sounds, you can have the quality products and expert knowledge too. If you need help choosing your next LG TV, Sonos Turntable, Samsung speaker or other product, you’ll find direction on everything from sizes to specs to ensure that you’ll invest in the right goods for you and your home. From the lowdown on soundbars to the difference between LCD and LED televisions, you’ll be able to find a wealth of information online! Visit the Tech Blog to read reviews on the latest products to hit the shelves and you’ll find hot album reviews and much more to inspire you too. Rest assured that you’ll be getting the best products at hard to beat prices, and for a richer television and music experience, always think Richer Sounds. How do I use my Richer Sounds voucher code? Copy a voucher code for Richer Sounds and head to the online store. Select the products you’re interested in and ensure that they are available to buy online. Click ‘Buy online now’ and ‘view basket’ when you’re ready to check out. Click ‘I have a gift voucher/code’ button to enter your voucher code. Click ‘Apply and continue to checkout with your Richer Sounds savings. Be sure to discover the Richer Sounds daily deals for select discounts on sought after products! Does Richer Sounds have clearance products? There is a bountiful section of clearance bargains to browse online where you can shop by store location and find a great price across tonnes of products. What are the Richer Sounds opening times? Whether you’re in London, Birmingham or Bristol, find your local Richer Sounds store online to see its opening times. Will Richer Sounds products come with a warranty? Most items from Richer Sounds will come with a 6-year guarantee and there is the possibility to extend this further too. Standard Delivery is FREE on the majority of items. Next Working Day and Named Day Delivery starts at £4.99 for TVs, and prices vary depending on their specifications. Should you wish to return your goods, you must inform Richer Sounds within 14-days of the delivery date. You will then have 14-days from the notification date, in which to return your items and Richer Sounds will cover postage costs. Email Richer Sounds using the contact us form. Electrical excellence and great value for money is what Richer Sounds is all about. This independent retailer stocks an expansive selection of TVs, audio equipment and more to impress movie and music lovers alike, so be sure to grab yourself a Richer Sounds discount code to discover what all the fuss is about. Whether you’re on the hunt for Home Cinema speakers, a new hi-fi or state-of-the art television, you’ll find expert advice and incredible products, all at exceptional prices from Richer Sounds. There’s a Richer Sounds VIP club that you can join for free. This fancy loyalty scheme will entitle you to member-only discounts, a 6 year guarantee on many TVs, wireless multiroom systems and projectors too. Simply sign up online and get closer to exclusive offers, and in-store advice when you book a VIP appointment. Telly time and your movie moments are about to get bigger and better than ever with Richer Sounds TVs. Boasting an exciting catalogue full of the latest and greatest televisions from Samsung, LG and many more favourite brands, your Richer Sounds voucher will let you save on unmatched, cinema-worthy specs. Think stunning picture quality, sharp sound and breezy control on an array of features, whether it’s the game or the latest Star Wars, it’ll be on at your house and it will be epic.